Agathion swings the left arm which previously vanished up to the elbow. The torn and tattered cross-section has a rough feeling similar to the white sand wall at the neck. Hifumi even saw the left forearm bursting open, but he didn’t understand the theory behind it. While protecting his throat and face by placing both arms in front at the moment he was repelled, he went flying to the back. However, the damage he received was serious. As Agathion says with sneer mixed within, both arms of Hifumi are bloodstained from the tips up to the elbows. The sleeves of the dougi have become short as if they had been forcibly torn off. 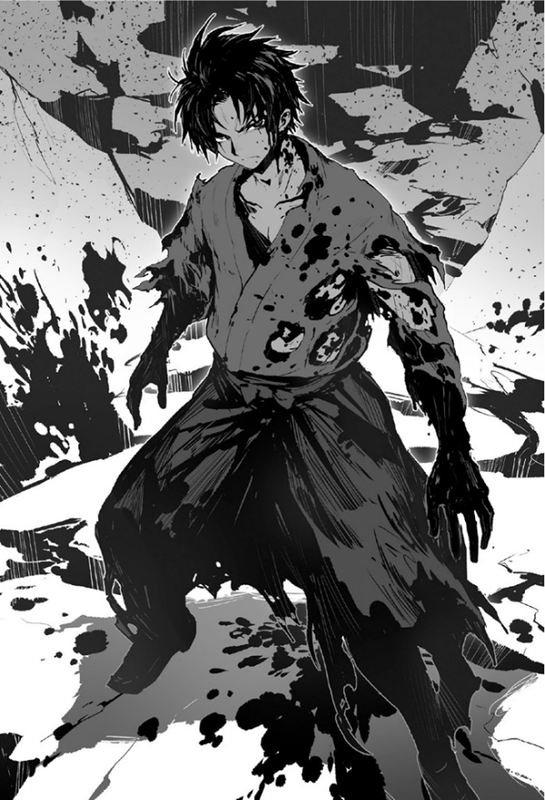 The exterior of the forearms, which he had put in front of him to protect himself, has the skin ripped up even though the bones themselves are fine. With the muscles having snapped, he can’t move the arms up to the elbows. “How regrettable”, Agathion shook his head. While repairing the gouged out throat, the left arm begins to grow little by little as well. It’s only natural, but Hifumi’s state isn’t something that can be fixed spontaneously. The dripping blood doesn’t stop. “It’s fake though”, Agathion laughs. With an assembly of raw materials transformed into a substance of mana, he is just maintaining a fake human shape, but nevertheless he is reproducing breathing and palpitation. “Due to a magic failure caused by me manipulating my unique magic, my entire body ended up getting rearranged by that magic and transformed me into a substance, but you won’t understand anyway even if I explained”, Agathion talks about the further details. Phegor will likely die any time now, too, Agathion averted his look. In that moment Hifumi once again fiercely ran up to Agathion as if not feeling any pain. “That’s no fun”, Agathion shoots pellet after pellet. Hifumi, who eluded those rocks by forcibly bending his body, held out a jet black blade from his right arm. Agathion, who unintentionally made a shrill and nervous voice, had the regenerated left arm cut at the shoulder by the black blade while still not comprehending the state of affairs. The true identity of the black blade was something changed into the shape of the darkness storage’s outlet simply created with darkness magic. It’s thin to a degree that one won’t be able to see it if looking from the side. And since it doesn’t penetrate living creatures it’s possible to use it as physical weapon if it works properly, he thought. While pressing on with a brute force approach, the strange sword attacks of Hifumi continue. Agathion tried to pin down the blade, which struck him diagonally from below upwards, but had his right forearm cleaved arbitrarily. Moreover Agathion evades the diagonally downward-swung slash of Hifumi by taking a half step back. Hifumi, who is heaving heavily while losing blood, noticed something odd. Hifumi calmly observed the attacking pellets and cut them down. He has become used to the speed and trajectory of Agathion’s attacks. Stepping even further in, Hifumi points the blade at the torso and face after the limbs. It was at the time he slashed for the 4th time. Agathion raised his voice and dodged the slashing attack by bending his body. Accordingly Hifumi’s movements come to a halt. Agathion ridicules Hifumi in order to provoke him, however Hifumi’s shoulders are trembling. Although Agathion was puzzled, he once again placed around 10 pellets in mid-air, but at that moment Hifumi burst into laughter. Suddenly ceasing his laughter, Hifumi stared at Agathion with a serious look. At the moment Agathion knitted his eyebrows asking “what are you saying this late in the game?”, Hifumi’s fierce attack began once again. However, unlike before, he is persistently wielding the blade while aiming at the chest. Agathion barely averts the the slashes and thrusts, which are approaching him many times over while aiming at his chest, by sacrificing his arms. While staying silent, Hifumi swings his right hand which had transformed into a blade. Within the long exchange of blows, Hifumi’s blade cleaved open Agathion’s chest in a straight horizontal line. However, Agathion showed a smile. However, Hifumi doesn’t reply to that. Hifumi, who was struck by pellets hurled at him from the front as counter-attack, had the joints of both his shoulders broken and even his right hand blade vanished from the tip of his arm which dangled loosely. Hifumi, who doesn’t stop even then, pins down Agathion left foot by stepping on it and thrust his head into the armpit of the still remaining left arm. Hifumi, who roared a war cry, raised his body and was able to forcibly throw up Agathion’s left arm. Originally it’s a move to stab a dagger into the part which has no armour by opening up the flank of the opponent with the body, but the aim this time is another. The chest wound, Hifumi had caused before, opens up by force. In there something red with a diameter of around 10 cm, just like a gem buried in sand, is pulsating. Agathion, who noticed that it had become exposed, spoke in a way of behaving as if he had the leeway even while becoming pale. Sweeping the foot he stepped on, Hifumi thrust his face into the chest of Agathion who toppled over while facing upwards. Ignoring the pleading, Hifumi opens his mouth widely and his teeth sink into the heart. Forgetting to use magic, he beats Hifumi’s shoulder and back with his left hand. However that doesn’t last for long either. Crunching on the hard surface and the soft inside, Hifumi’s front teeth bit into the heart mercilessly. Once he spit out the objects he held in his mouth, fragments smeared with a red fluid were thrown onto the ground. A syrupy and sticky red fluid spills our from the remaining heart and is absorbed by the surroundings which has taken the shape of sand. Agathion died while his eyes were wide open in terror. Hifumi has also lost a considerable amount of blood. Losing strength in his knees, he sat down on the ground with a thump. Even while sending the arms flying and gouging out the throat at the time he fought with Agathion, he didn’t have the actual feeling of stealing life. But now, with him having been basked in the fragrant liquid after biting into the pounding object, he finally obtained a sufficient amount of that sensation. He earnestly muttered within his dimming consciousness. With pebbles and sand spreading and a pile of debris rising in the centre, that, which ought to be a hall you could even call impressive, has lost its shadows. The ones peeking at the situation from the left and right side of the entrance are the two demon girls who magnificently barfed in front of the gate after following Vepar. In the hall itself, there is Phegor, who has fallen to his knees and is pitching forward as if about to fall while being pierced by the katana, and the figure of the king, who collapsed with a pale face and red blood shedding from his chest on a platform visible inside the hall. Next to him was the figure of the human who was sitting as if watching over the king. And, none of them even twitches. Vepar valued the two girls, who are able to use healing magic, highly. They are brought along at every opportunity for the sake of rescuing wounded people who appeared during battles and in accidents during practise. Bennia, who was the vice captain, summoned those two to the attack site because she feared there would be too much evidence left behind at the actual site if injured people emerged in a counter-attack, but Vepar truly thought that it would be the best if there are no wounded or casualties. As result of that, the two girls haven’t grown in regards to combat at all. Stating it bluntly, they were useless on scenes with no wounded and at the front-lines where there’s no time to heal. They have been ordered to assist in bringing the chaos within the castle to a close by Vepar. Listening to people, who have watched the situation while hiding within the castle, they were ordered to heal the survivors’ injuries if necessary and to check the state of affairs in the hall where Hifumi was supposed to have headed. Pheres, who is only one year older, timidly approaches Phegor and Nyal follows behind her. Both of them are holding knives as an excuse of arms and are wearing capes with a flare skirt. However, they don’t really know how to use either. Grasping the knives tightly with both hands anyway, they walk forward while somewhat silencing their footsteps by standing on their tiptoes although they wear boots with heels. Phegor, who has died while clinging to the katana within a puddle of dried blood, has his face hidden and his expression can’t be seen. As one would expect, no matter how good one is with healing magic, it’s impossible to resurrect the dead. What Njal pointed at is Hifumi’s katana which has penetrated into Phegor’s body. What Pheres pointed at is the figure of Hifumi who is sitting down with his back turned towards them. At the time when Njal quietly extended her hand towards the katana, Phegor, who opened his bloodshot eyes widely, lifted his face which had lost all its blood. He probably can’t see with his eyes anymore. Did he hallucinate that Njal, who is standing in front of him, is Hifumi? Opening the hand which grabbed the guard of the sword, he stretched it out towards Njal. In front of a situation similar to a dead having started to move, Njal raises her voice into a scream and Pheres isn’t able to move either as she has become stiff. However, repelling the stretched out hand of Phegor by kicking it from the side, it doesn’t reach Njal. Hifumi, who was the one kicking, looked down on Phegor who feebly collapsed. Without listening to the girls, Hifumi grabbed the hilt of the katana which was stuck in Phegor’s chest and pulled it out in one go. Does he still feel pain? Holding down the wound from the extraction of the katana, Phegor groaned deeply. Hifumi swings down the katana, he had raised overhead with the force of pulling it out, with his right hand. As he had apparently already lost a lot of blood, not much of blood flowed even when the head was cut off. Phegor’s freshly severed head rolled up to the feet of Njal and she sat down while unable to stand up out of fear due to his extremely gruesome expression that gives one an impression of his feelings of resentment. Being hit by her knee when she did so, Phegor’s head rolled in the direction of the day after tomorrow. Once Njal raised her eyes, there was the figure of Hifumi who is cleaning the katana with a paper. At the moment Njal, who thought that she had been saved, tried to somehow muster her voice to thank him, the katana was thrust before her eyes. Remembering the katana, which had a beautiful lustre as if just having been washed, easily beheading Phegor before, Njal gulped down her spit while trembling. She thought that she had been rescued, but it seems to be somehow different. Even Pheres who is next to Njal and can’t do anything but watch the situation unable to say anything, this late in the game regretted while thinking it would have been alright even if we had simply ignored the dispatch order by Bennia. Please don’t tell me he`s going to be like those monster from terror movies that never die. Dude, Hifumi sink his teeth into it, biting it till the demon die on the horror about it. From where come the blades if hifumi couldn’t move his hands, from the elbow??? and before “eating” the king did he headbuck the armepit of the king for opening the chesst??? For me it was also hard to visualize that figth. Glad he still has those healing potions. That black blade… I feel like it was storage space just slightly opened right? When they were explaining the blade that’s what I thought. I’m not sure if I’m right or wrong. It’s all good thanks for clarifying that. With a blade like that you could attack people with out killing them, since it can’t absorb life. He could destroy every weapon and armor and stop at the skin.